ow We Improved Our Internet / Wi-Fi Reception In Caravan Parks And Remote Areas... and how you can too! How We Improved Our Internet/Wi-Fi Reception In Caravan Parks And Remote Areas... and how you can too! A solution for every budget - from $7.00 up to several hundred dollars. We always enjoy complimentary Wi-Fi when available in Caravan Parks, but invariably, the signal can fluctuate between poor and lousy. Free Camping in the Outback presents even greater challenges, where a signal can't be established for love nor money. I had read on Forums, where caravanners had employed an outside antenna as a means of boosting any available signal, but my knowledge and understanding of such things was rather limited. So in 2014 I set about trying to educate myself a little and see if a solution could be found. I knew it could be done... it was just a matter of finding a suitable, affordable solution for us. I started where all good searches start... Google. As it always happens, one search led to another, then to Articles and to YouTube videos and after numerous late nights, I decided on a course of action. It was pretty much a given, that I needed an outdoor antenna of some description. Some suggested a Omni-directional antenna, like the one on the right, while others recommended a directional antenna. One video in particular really caught my attention. I kept coming back to it. It was produced by a guy who does all this Wi-Fi stuff (and more) for a living, through his U.S. Based Technology Integration company, Axiom Technology Group. In the video, he outlines what they have done, to achieve a strong Wi-Fi signal wherever they travel... in their case, overcoming weak Wi-Fi in van parks. This is the Directional Antenna he uses and has it mounted on top of his Motorhome. I took his lead and ordered the same unit from a supplier in Melbourne. The Antenna arrived quickly, along with 6m of Low Loss Antenna Cable, also from TP-Link. While I won't be following his set-up to the letter, this Project will involve fitting the Antenna to a suitable telescopic pole, to be deployed on the caravan drawbar (near the satellite dish) when required. The wiring will be routed into the van, to an easy access point near where I sit at the computer. To make attaching the Antenna to the pole an easy task each time, I fabricated this mount, using a piece of 32mm PVC pipe and a $3.00 paint roller handle. The metal roller attachment end was cut off and the screw-in section wedged into the pipe. I used a heat gun to soften the PVC pipe end to accommodate the square end of the handle. A stainless steel machine screw and nut was attached through the handle, to keep it from moving. I glued a little container cap on top, to keep out the weather. With the stainless steel clamps tightened, it becomes a permanent fixture, ready to quickly screw to the painter's pole on arrival at camp. The Antenna packs away in the nifty little bag that Bev made for it and the pole takes up very little room in the tunnel boot. The painter's pole attaches to the drawbar by a simple 'L' bracket and clamp arrangement. The "L" bracket is 'permanently' attached to the drawbar. 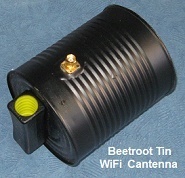 If connecting to just one device in your caravan, say, a laptop, then nothing more is required, except an inexpensive USB Wireless Adapter and a N to SMA pigtail. The lead-in from the antenna, which has a N connector, attaches to the N connector end of the pigtail and the SMA end screws to the USB Adapter, after unscrewing the dipole antenna. The USB Adapter then plugs straight into your laptop. We wanted to be able to connect more than just my laptop. We also wanted to connect Bev's laptop, our phone and Wi-Fi Printer as well. For this to happen, we had to add a Booster and a Extender/Repeater to the mix. There are a number of choices on the market to achieve this, but the combo I chose, was the Alfa Wi-Fi Booster (Model AWUS036NH) coupled to the Alfa Networks R36 Extender/Repeater. 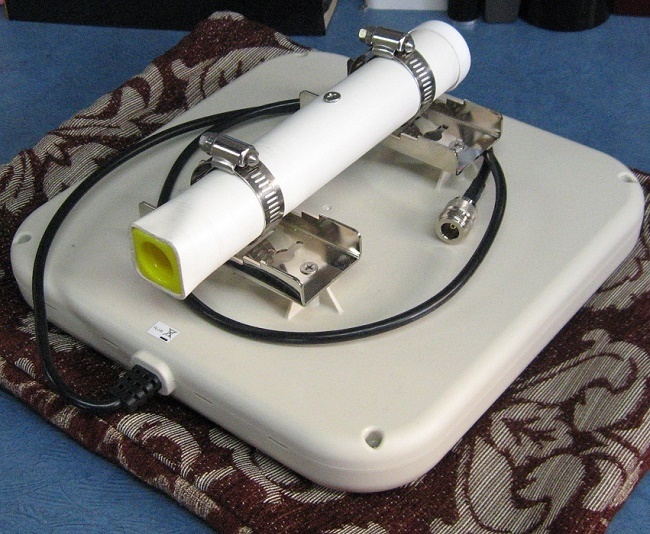 With this setup, the feed from the TP-Link Directional Antenna (or any antenna) is fed into the 036NH Booster, which in turn connects to the R36 Extender. The R36 is a nifty little unit and can be programmed as your own secure, password protected Hot Spot. One point of mention though, if you're considering a set-up like this, be aware that it's not Plug and Play. You will need to be a little computer savvy, as the R36 needs to be "programmed" with your info, but there are clear instructions available, as well as step-by-step videos showing what needs to be done. By this time I was starting to get the hang of things and as I like to have more than one arrow in the quiver, I added another antenna to the mix in the form of an Outdoor Omni-directional antenna. The one I chose for this, is also a Alfa product, the Tube-U (N). This component comes with a 8m USB cable that runs to the USB port on the R36. 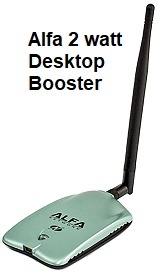 It by-passes the Desktop Booster, as the base of this antenna is a 1-watt (1000mW) high power amplifier (Booster), a receiving radio that picks up the distant Wi-Fi signal. It is fully weatherproof and can handle outdoor temperatures down to freezing. If desired the Tube-U(N) can also be plugged into the USB port of a compatible Windows computer to extend the range just to that PC, but using it with the R36 will allow you to share reception with multiple Wi-Fi enabled devices at once. The Omni antenna is sold separately and screws into the top of the "Tube". 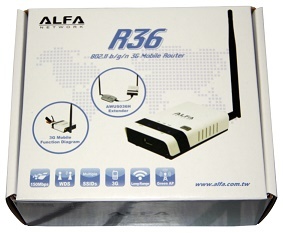 One thing I wasn't aware of when I was shopping for solutions was, the Tube-U and the R36 Booster/Extender now comes as a kit, called the Alfa Wi-Fi Camp Pro. At time of writing, RFShop in Adelaide sell the Kit complete, for $149. This kit combines the R36 portable Wi-Fi router, with the Tube-U outdoor USB wireless adapter, and a high performance outdoor antenna AOA-2409. 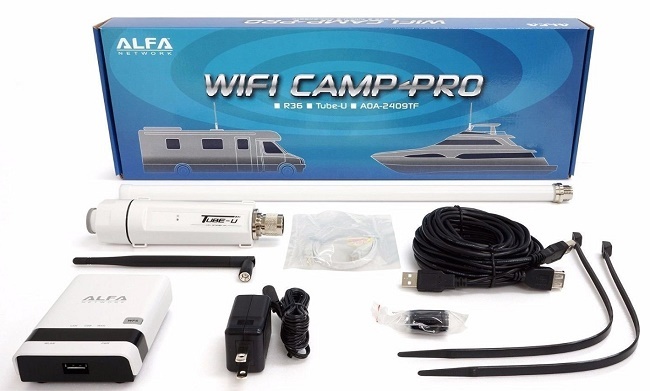 Camp-Pro offers convenient, extended wireless access whenever you're in a camping site or on a boat. Remote wireless can easily be connected via the Tube USB wireless adapter and the R36 broadcasts the received signals to your local devices. 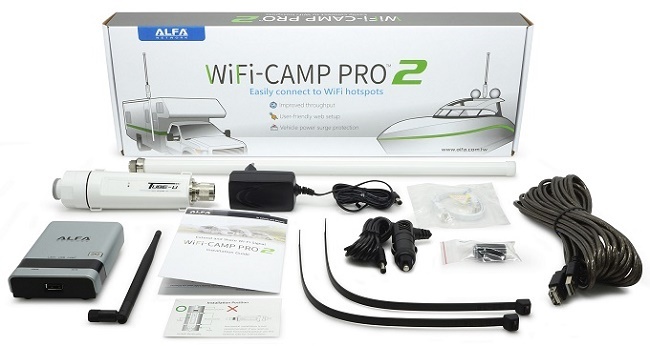 UPDATE JANUARY 2019: Alfa have now released their new Wi-Fi Camp Pro2 Repeater Kit. It's $215 with free shipping anywhere in Australia. Click image for full description. By now, I had really caught the Wi-Fi Bug and as my knowledge and understanding grew, I wanted to see what else I could add to the arsenal. Without boring you with the details, here are the extras I added to our 'Wi-Fi Kit'. in a signal up to 20klms away. The first three require the Desktop Booster mentioned previously. Now that I have all the parts to the puzzle assembled, what do I think is the best solution? All of these solutions will work and naturally, it all depends where you are parked. But for best overall performance in most situations, I'd have to vote for the Alfa Tube-U and Antenna combo. It's a great, all-round, powerful Omni Directional setup. Being Omni-directional, it doesn't require pointing and is great in fringe areas. For around $150 the Wi-Fi Camp Pro Kit is a great solution. A close second, would be the TP-Link Panel Antenna. Get it high and pointed at the source (it's Directional, remember) and you'll have fantastic reception. The Panel costs around $99, the low-loss cable around $40 (essential) the Desktop Booster $30 and the R36 to connect other devices $62.00, for a total of around $230. If you mainly stay in caravan parks, the Ubiquiti NanoStation is a powerful ally to have. I've not said much about it here, mainly because the set-up stumps most people. Ubiquiti products are very commercial, so the internal interface is not intuitive. Good for Installers, but not the average layman. You'll need to be computer savvy. Having said that, I had no problem following the detailed, step-by-step instructions in the video below. So, if you're considering buying a NanoStation, watch this great Instructional Video. You'll soon know whether or not you're up to the task. Even though the video is 4 years old now, all the info is still current and applicable. As part of their NanoStation system, Ubiquiti have stopped producing their AirGateway product and have replaced it with a device they call AirCube ISP. This is the device you connect all your devices to wirelessly. The new video that walks you through the setup step-by-step, is shown below. The "Under $100" mentioned in this latest video, refers to the United States in US$. It will cost more than that in Australia. How far from the broadcast point you are parked. If you're stuck down the back or bottom of the park, you're going to need a strong unit. How good your line-of-sight is to the point is. Wi-Fi is line-of-sight, so the less trees and buildings in your path, the better. That's why you need a tall pole to get as high as possible in some situations. The strength of the signal broadcast by the Park. Not all Caravan Parks have or can afford the best Wi-Fi Broadcast equipment. You may have the best equipment available, but if the signal is too weak, there's nothing more you can do, except ask to be moved to a site closer to the point.